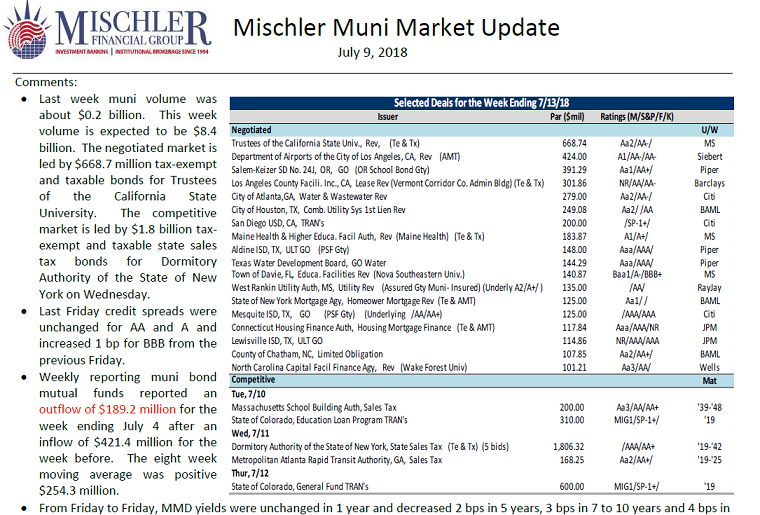 Municipal Debt Deals-New Issue Calendar Week of July 9: NYS Dormitory Authority Sales Tax Bonds…Mischler Muni Market Update looks back to last week’s muni bond issuance, municipal bond fund flow metrics and a focused lens on the muni bond new offerings for this week. As always, the Mischler Muni Market Outlook provides public finance investment managers, institutional investors focused on municipal debt and muni bond market participants with a summary of the prior week’s municipal bond market activity, including credit spreads and money flows, and a look at pending municipal finance offerings tentatively scheduled for the most current week. Last week muni volume was about $0.2 billion. This week volume is expected to be $8.4 billion. The negotiated market is led by $668.7 million tax-exempt and taxable bonds for Trustees of the California State University. The competitive market is led by $1.8 billion tax exempt and taxable state sales tax bonds for Dormitory Authority of the State of New York on Wednesday.